One of the techniques we learned during our training was storytelling. To integrate this technique into my tours, I look for opportunities to find out our visitors’ “Coming to California” stories. I always tell them a bit about mine, which started in 1977 when I decided to move from Portland, Oregon to San Francisco. But my bigger story is about Michael Kelly arriving in Seattle—which I reported in my first blog posting. Now might be the perfect time to tell you about the other side of my “Coming to California” story. In order to construct this part of the story, I emailed my first cousins. There are seven of us Zell cousins: My sis, ZiZi (née Alexandra); Uncle Harry’s children, Lenny, 87, and Marilyn (1924-2012); Uncle Julius’ children, Marty, 87, and Alan, 84; Daniel’s son, Ted, 77; and me, 65. 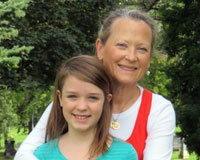 Janet, who is married to Alan, is the family repository for all memories. She interviewed Uncle Julius in 1975 at the Oregon Jewish Museum, and she is my go-to-girl for all things having to do with family stories and dates. She answered my first question about the half sisters’ names. But she was unsure about a date and dashed off an email, as well as asking her husband. My father was the youngest of four brothers who grew up in an orthodox Jewish ghetto in Lemberg, Austria. My father was born in 1906; Uncle Harry, née Herschel, in 1893; Uncle Julius, née Samuel Julius, in 1895 and Uncle Dan, née Daniel, in 1898. 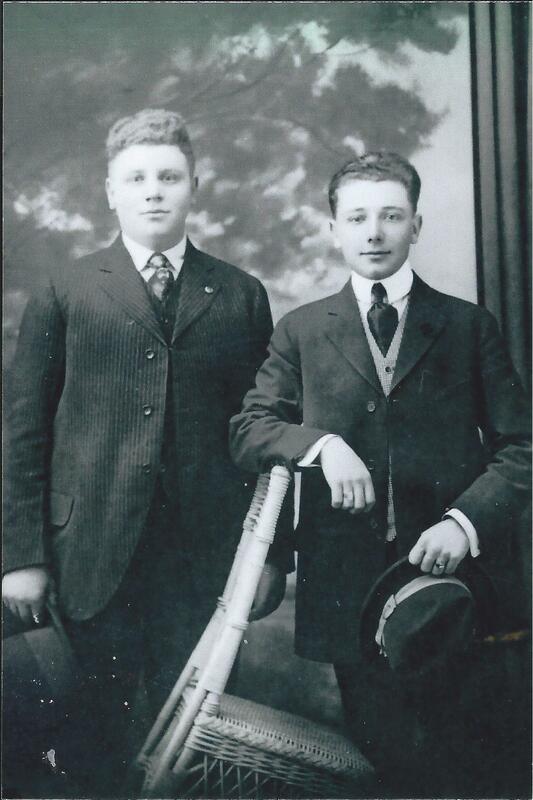 Two of the four brothers left Lemberg, Austria by ship to come to the United States in early 1900. It is possible that Harry came in 1909, followed by Julius in 1910. They first landed in Toronto, Canada, then came to New York. With very little money, they worked first as garbage men. Soon, Uncle Julius got a better job as a window dresser, while Uncle Harry learned the diamond trade and later trained as a gemologist, mentored by the diamond dealers in the Hasidic Jewish district of New York. In 1917, Julius returned to Lemberg, which had now become part of Poland, to retrieve the rest of his family. He returned to find that their father, Meier Zell, had died. After gathering their mother, Taube (dove, but called “Turtletaube” by my grandfather), Daniel, my father Moishe and their half-sisters Rose and Frances, they boarded a ship and arrived on Ellis Island for their official immigration into the United States of America. However, there is an account that Rose came before all of the boys and stayed in New York for a period of time, though there are no documents that I have found to back this up. During the voyage in 1910, the ship stopped in the mid-Atlantic and was met by another ship that carried Enrico Caruso. Uncle Julius used to tell the story about how they could hear Mr. Caruso sing from the deck of the ship. Corroborating this, on Ellis Island there is a recording of one of the passengers saying that Mr. Caruso sang to the immigrants as they waited to be processed. You can see that stories are wonderful tools to help make history come alive. Julius (left) and his older brother Harry, my uncles, on their way to the United States in 1912. My father and his brothers’ names were changed during the immigration process, transformed into more common ones on Ellis Island. This was a frequent practice. My father’s name, Moishe or Moses, was very common among Eastern European Jews, while the most common given on Ellis Island were Milton and Michael. My father’s given name, Moishe, was changed to Milton. Samuel Julius eventually took his middle name for his first and became Julius. In 1941, Budd Schulberg wrote a rags-to-riches story about the life of Sammy Glick, a Jewish boy from the lower East Side of New York. He wanted success but was not an honest type. The story also became a long-running musical. It was later aired on television in 1949. Uncle Julius did not want to be associated with such a character, although he was some character in his own right! Julius was always a portly fellow, and in the musical, there was a reference to someone who was overweight as being a “Fat Sammy,” which Julius didn’t like either. My father first visited California in 1945 during WWII, years after arriving at Ellis Island, when he was stationed at Camp Stoneman as an optometrist in Pittsburg, California. There he made many friends who lived in California and whom he visited often over his lifetime. After he married my mother, his mother-in-law, my grandmother, moved from Oregon to Santa Rosa, California to take advantage of the redwood forests that needed to be harvested. And I visited her often during my life, which is why I moved here. Where were your parents born? Your grandparents? How did they come to California? Do you think they flew in a plane? Why do you think they decided to come to California? Keeping the questions simple helps the visitor feel open to responding and helps me navigate some wonderful stories. You know you have a good story when the teller has that look of pride on their face and they stand up just a little taller. Over the years the museum has collected many stories, now written in our wiki site. During one of our first trainings, Mitchell directed us to a wiki site specifically for the docents. We also have a public site called Picture This: California Perspectives on American History. The site is a wonderful resource of photos, each with their own story for the public to discover. During our training we had to learn some of these stories, but there were many more to learn and even write ourselves! During training we became familiar with stories about José Cardero, Levi Strauss, James Marshall, Sam Brannan, Simon Dikeman, the California Banknote and Modesta Avila. José was a ship’s illustrator, Levi Strauss made the denim pants for the gold miners, James Marshall discovered the gold, Sam Brannan became the first millionaire, Simon Dikeman supervised hydraulic mining, the California Banknote was money in the form of a cowhide and Modesta Avila was a young woman who protested the Santa Fé train tracks going over her property and died because of her protest. Those are the facts. But to engage our audience, we need to weave those facts into a story. So much to read.… Every week that we met, Mitchel gave written material to add to our collection. I have long since filled my original binder and have made numerous trips to Staples for matching orange ones. On the third week of our tours, Mitchell encouraged us to try something new and I decided to integrate even more storytelling into my tours. I immediately began flipping through the notebooks to discover someone new to introduce: Frank LaPeña, a Wintu Indian artist; a little story about Domingo and Antonia Peralta, who found a quail’s nest; and a native American girl’s life on the Missions. Several hours passed as I traveled through my binders and the books I now have in my personal library about the Gold Rush, marking pages with post-its. I also spent time in the “wiki stacks.” There was so much to read! The internet made it endless. My Museum Binder was now covered with Post-its, reminding me of the movie Bruce Almighty, with Jim Carey. In the movie, Jim Carey’s character, Bruce, wants to take over God’s job— and he gets his wish. In trying to organize the world’s prayers, he decides to have the universe put them all on Post-its. As you can see in the photo, he is overwhelmed with the little rectangles! My Post-its were orange of course! But like Jim Carey’s character, I too was feeling somewhat overwhelmed, and I had not yet decided on a new story character to add to my tour. On my next tour, even though I didn’t have a new story, I added a new technique. I had the children act out putting on the high boots before they stepped into the cold mountain water stream to pan for gold. That was fun, but I still wanted to add some other stories no one had heard before. And one I hadn’t told before. I knew the stories of José Cardero and the others we had studied and had told them to many visitors already. But I was afraid that my storytelling was losing its crispness. While doing some more reading, I again read about the little girl who came to the Gold Rush as a small child and became a performer. 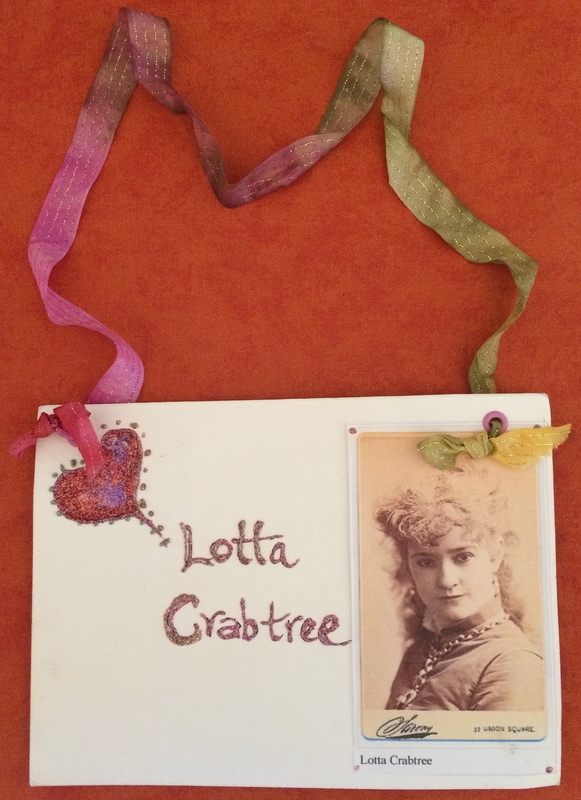 Her name was Lotta Crabtree. Perfect! This was about a child who was close in age to my student visitors. The photo I found of Lotta as an older child was adorable. She was in a frilly dress, with long carefully curled hair. Thinking about the contrast between her dress and the clothing of the mining camps, I found Lotta refreshing. I decided to make a name tag and add a photo and some glitter and a ribbon so that I could turn one of the children in my group into Lotta, then tell her story as if that student was Lotta. Front and back of the sign for a visitor to wear to become Lotta! Our training had also provided us with several sessions teaching us techniques for storytelling. Delivering the facts is one thing, helping your listener to connect with the story is another challenge. A story needs to have an interesting topic, characters and situations. There need to be some vivid images, either in your descriptions or an actual photo or drawing you can point out or carry. Objects help tell the story. Fortunately the Oakland Museum has so many authentic artifacts in the cases that docents do not need to carry much to the museum with them. I’ve found that a piece of tule and an acorn can go a long way when a story is attached. And I always carry a 4″ N-Gauge Western Pacific Freight Car. Western Pacific built the spur that brought the railroad from Sacramento to Oakland. It’s best to learn how to tell the story without memorizing it, which takes practice with your colleagues: different voices, humor, suspense, and the rule of three—when you offer examples, try to mention just three things. People can keep track of threes. In telling a story, we learned about incorporating strategies like having the children act out climbing the masts. Adding interesting facts helps all visitors make connections, such as: the tallest mast was called a “sky scraper” and that is where the name of tall buildings came from in our cities. 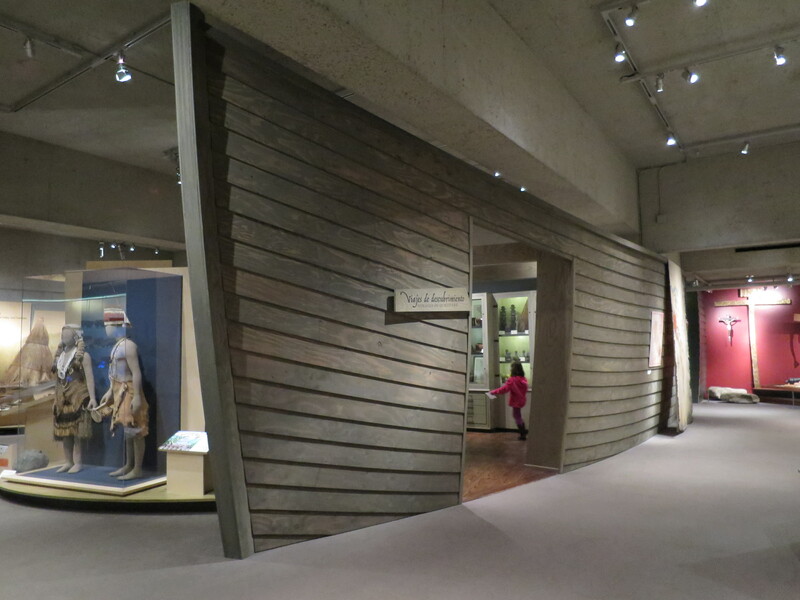 Asking, “What do you think you might see if you went on land during a voyage on this ship?,” I prompt the children by pointing to the evidence on display…a stuffed kiwi, a drawing of natives, a whale-tooth necklace. 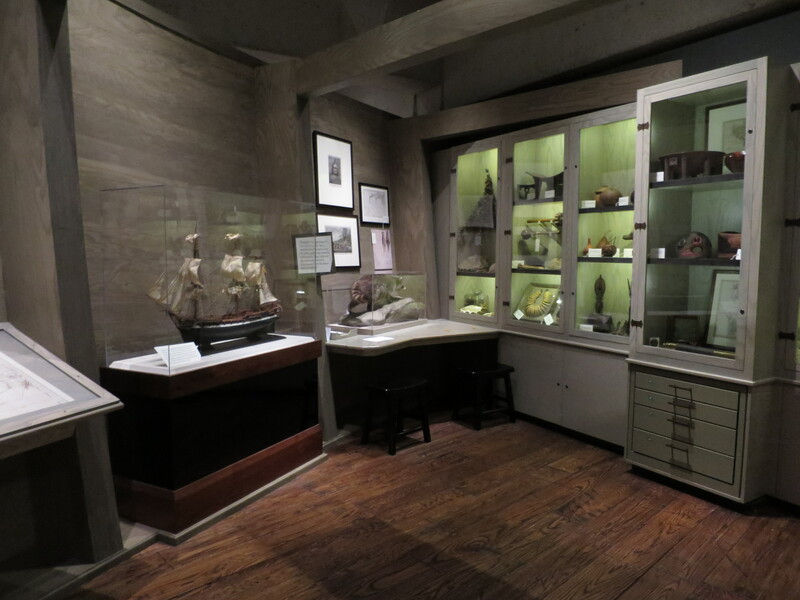 In the Discovery Ship Gallery, I can show them drawings of the native Californians the voyagers met, as well as of quail and drawings of the land from the ship. There are also artifacts on view that might have been like the ones Malaspina and his crew brought back. Prompting our visitors with connections they can make to their own lives can be helpful. It is a powerful learning tool to have the children or adults find their own answers with a little bit of direction. Eventually visitors will talk about their cameras or cell phones, realizing that since these did not exist in the 1700’s, drawings were one way for the explorers to report back home about the people, land forms and wildlife they encountered. Now, the children can be prompted to pretend they are seeing land from the ship and have to decide what to draw. What if there had not been a ship’s illustrator? Which things in this gallery would not be here without José? Ideas, from our museum reading materials and those we discover fused with the ideas of our visitors of all ages, provide inspiration to develop more interesting tours, both for us and our audiences. So much to read and so little time.… Well, the truth is that we love this charge of having so much to read. And I forgot to mention the library in our docent center—even more to read! This is a story about a little girl named Lotta Mignon Crabtree, who helped the miners so far away from their families not to miss them quite so much. I told the children in that first Lotta tour that when my girls were little and I took a trip with their father, even for a few days, I really missed them. At this point, I asked the children if they remember missing their parents or a relative that they cannot see all of the time. Then I continued, “Well imagine how your father might have felt if he left you and the rest of your family for a year to find a job that made more money. One of these men was John Crabtree. 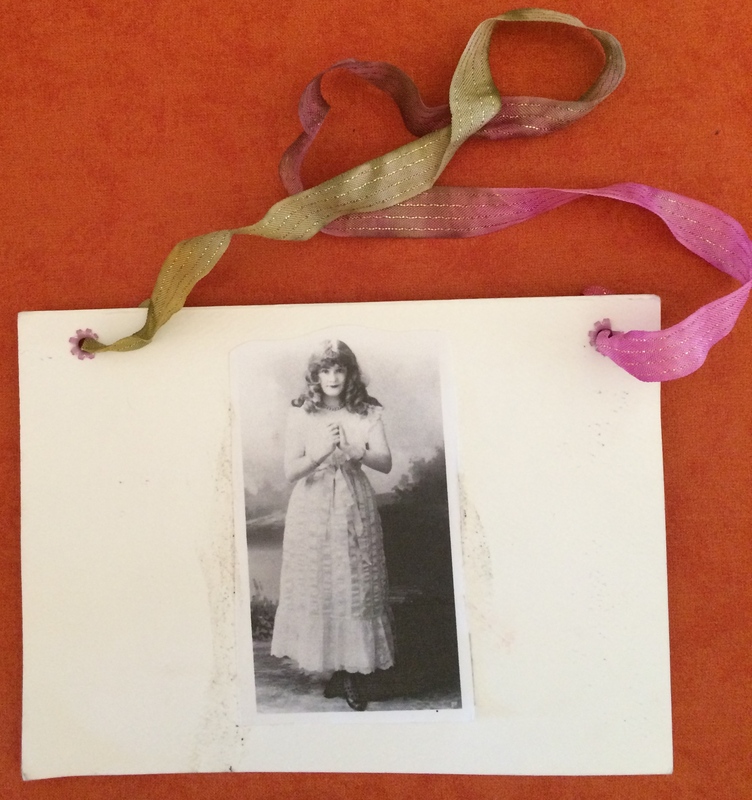 “One morning Lotta, who was just four years old, found out that her father was going to leave their home in New York and travel to the Gold Rush in California without her or her mother. Lotta was going to miss her father very much, but he had a bookstore in New York and he thought people in California might like books too. He had heard that he could make a lot of money in San Francisco and some of the towns near the Gold Fields. “Lotta’s father left for San Francisco. They waited for two years for her father to return. One day her mother, Mary Anne Crabtree, just couldn’t wait any longer and she said, ‘Lotta, we are going to join your father in California. 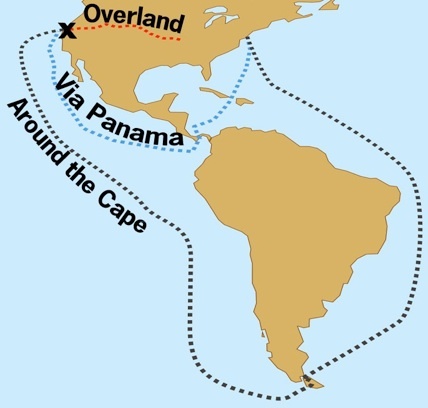 I have sold our book store and we are going to go on a steamship!’ So in 1853, Lotta and her mother boarded a steamship and arrived in San Francisco via the Panama Route. “Eventually, they found John Crabtree and all three of them ended up in Grass Valley. “How many of you like to sing and dance? Do any of you play an instrument?,” I asked at this point. “When she was 8 years old, Lotta began touring the Gold Country as an entertainer. The men, who missed their children, loved to come and watch her dance and sing to her banjo playing. “Lotta got a lot of gold. But it wasn’t from the Gold Fields. When she performed, everyone thought this little girl was so cute that they would throw gold nuggets onto the stage. Lotta loved being an entertainer, and although she was only eight when she started, she kept dancing, singing and playing her banjo to make the miners happy. “Her mother, who was her manager, collected all of the gold and put it into bags. When the bags got too heavy, she put the gold into a steamer trunk. When the trunk was too heavy, she bought land with the money. Since they toured all over the Gold Country, the trunks of gold were too heavy to take with them, so it was easier to buy land. They became wealthy landowners and also owned boarding houses in the Gold Country. “Several years later Lotta and her mother moved back to San Francisco, where Lotta became very successful, eventually touring on the East Coast. By the time she was 27, she was one of the most highly paid actresses in the United States. Until Lotta was 45, when she retired, she still played children’s parts. Her middle name, Mignon, in French means “cute” or “dainty,” a name that fit Lotta very well. She was tiny and could play the part of a child, even though she was an adult. She also sprinkled her red hair with cayenne pepper to make it sparkle in the theater lights! I followed this part of the story with questions. “What do entertainers now do instead of cayenne pepper?” Children answered with everything from putting glitter in or dying their hair different colors to shaving their heads and tattooing their scalps! “When she retired, Lotta spent the rest of her life in Lake Hopatcong, New Jersey. But she continued to make people happy. 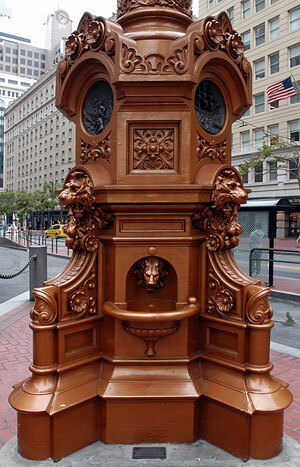 She loved animals, and in 1875 she built a fountain in San Francisco, for both people and horses, which still stands at the intersection of Market and Kearny Street. She also left $300,000 in her will for charity to the Lotta Dumb Animal Fund. That was a lot of money in 1924—almost $4 million. This fountain is the gathering place for all survivors of the 1906 Earthquake on April 18. This was the first story I added to my tour, and more would come later. Love the family history. So special to read that. Congrats on the site. I have a big gold rush library too! The book that really pulled me into the gold rush was Jim Holliday’s Rush for Riches. It’s been one of the great reads of my life: full of fascinating first-hand stories and photos/illustrations. It was the book that accompanied the Oakland Museum’s celebration of the gold rush in 1998-99. L. Tom Frye, director of OMCA at the time and still alive, signed my copy. Regarding family histories, my favorite OMCA show was The African Presence in Mexico. I gave many tours of that show and really enjoyed being able to tell one of my family stories. My great grandparents were expatriates in Mexico at the time of the Mexican Revolution of 1910. My great grandfather was a mining supervisor. My grandmother and her sister were born in Mexico! The family had to flee the revolution in 1913. They barely made it out alive! One of their neighbors, a British woman, was shot to death. My great grandparents brought their family back to Kansas, until my great grandfather was offered another metals-related job in Wilmington, California. That’s how I ended up here! I enjoy your blog. Keep it up! THank you, John. I just ordered a copy of Rush for Riches. Can’t wait to read it! Really interesting, Emily. I’ve collected stories from my mom that I hope to put into story form someday! Lotta gotta lotta gold, when singing/dancing she was bold, after daddy went a mining and left her home a pining, she travelled west performed her best and made her red hair shining. Hello Emily! It was very nice to read your family history of immigration from Lemberg. My Dad and I have DNA matches with you and other members of your family – our connection most likely beginning way back in Poland. Would love to hear from you and figure out more!